I know we have these in the area because I've found a couple of dead ones, and now I'd like to find some live ones. I'm in Central Texas, and there's a vacant lot with some old trees next door to my house, plus a gas station about a mile away that's surrounded by forest. I assume these would be decent spots to look, but I'm not sure if it's the right time of year to find these. I've read that the larvae morph into adults in "late Summer", but I'm not sure when that is. Now? September? Does anyone know if the banana+beer bait is effective for these? How territorial are they? I have an 18" square enclosure I'm thinking of converting, and I'm not sure if I could keep a few beetles in there without a divider, should I be lucky enough to get more than one. Also, do they need any substrate in particular? I don't plan to breed them, but I know they need places to burrow. Is an organic potting soil (containing perlite) acceptable, or should I go for coconut coir? If I do end up with eggs, would it be OK to just take the eggs outside and put them in a suitable spot, assuming the adults were caught a mile or two from my house? I don't want to try to raise the larvae, but it'd be a shame to just let the eggs die. And will I see these guys out-and-about at all, or do they just hide all day? I won't have the room or the enclosure brightly lit, but I know they're nocturnal. 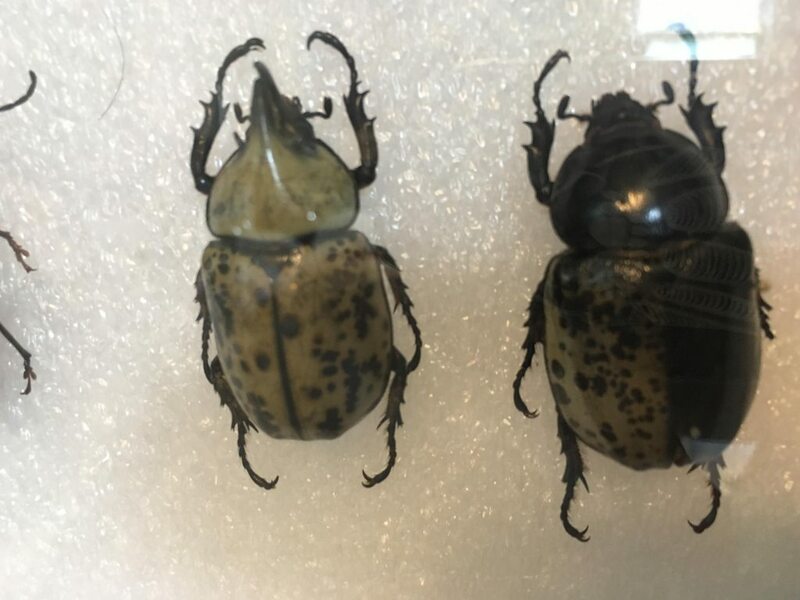 Orin's Ultimate Guide to Breeding Beetles can help you immensely, because tityus is one of his favorite (and thus longest) topics. Unfortunately I'm afraid to paraphrase the book, because your questions span the entire section and I don't think Orin would like it (legal issues?). So I'm going to call him over. Took a look around a few hopeful spots this evening. Lots of grasshoppers and cicadas attracted to the lights, plus geckos and toads come to eat the bugs. Coolest find was a female dobsonfly. No beetles aside from a few tiny ones, unfortunately. Dobsonfly, for those interested. 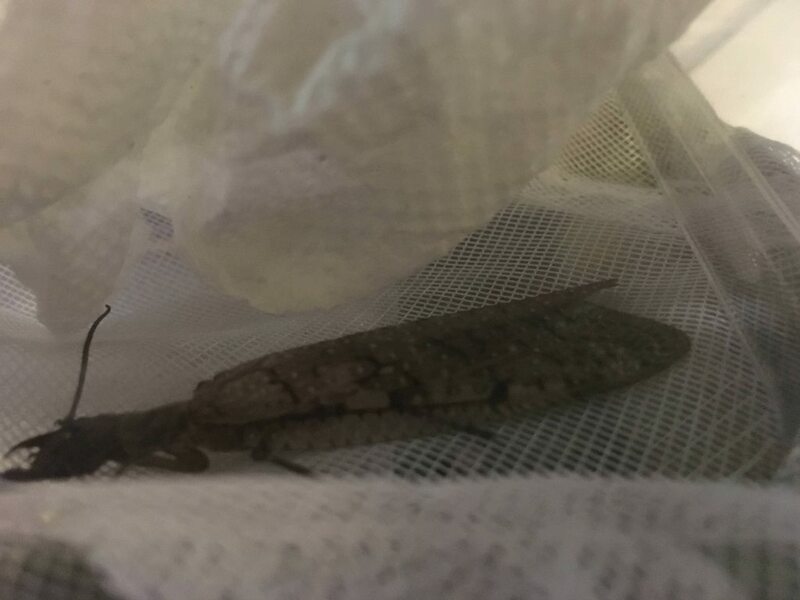 About 3" long, caught in a soft net and released unharmed (but annoyed) after the photo. I'm pretty sure I read that any Dynastes like these found in Texas are tityus, but I could be wrong. I can get them out of the case for better photos if needed. The female had that dark color when found, and it's stuck around. It seems to be pigment, not some kind of stain. I definitely want these, but I don't want them enough to go to Arizona. I'll keep trying around here. How long does it take for a bait to work? I'm not sure I want to sit out all night in somebody's parking lot with a smelly bait. They are D.tityus which is easy to see by the horn structure of the male. If you're not setting up substrate the larvae will eat the female probably won't lay eggs. You'd have to find a local tree-hole habitat to put them in if she did.